When dealing with History, Suddenly we see Rashtrakutas defeating Chalukyas and forming an empire. An Empire at one time stretched from Himalayas to Srilanka. Is it possible for someone to build an empire immediately coming to power. So we start digging and we come across Early Rashtrakutas. Undikavatika grant (Royal Asiatic Society, Bombay)of Abhimanyu residing at Manapura calls himself Rashtrakuta and also gives geneology. Indology scholars confused these early rashtrakutas with kings of Sarbhapura and for decades disimissed the Rashtrakuta rule. Then Pandarangapalli plates (Mysore Archeological Survey) were discoverd in Kohlapur. It gives geneology of Mananka, Devaraja, Avidheya. Dr.Krishna of Mysore Archeological Survey identified Avidheya as the third son of Devaraja. He also said that Devaraja, son of Mananka has three sons. Avidheya, Jayaraja, Bhavisya. Between the sons the extensive Rashtrakuta empire stretching from Mahanadi and Tapti to Bhima comprising of three Maharastras were divided. Jayaraja was ruling over parts of Mahanadi, Bhavisyas over Northern Maharastra and Avideya over Southern Maharastra and Northeastern Karnataka. Krishna son of Indra and Govinda who are mentioned as defeated by chalukya jayasimha and Pulakesin II of Badami belong to this family. Overthrowing them Pulakesin II become lord of three Maharastras. However Altekar of Bhandarkar Institute dismissed the vast empire of Rashtrakuta, claiming that many kings do not call themselves Rashtrakutas and other kings such as Nalas, Mauryas, Kalachuris and kadambas were ruling many areas of Maharastra. Rashtrakuta Empire in 5th century AD ? First the identification of sarbhapurias of Chattisgarh with Rashtrakutas was disimissed. Identification of Manamatra with Mananka and Sudevaraja with Devaraja was dismissed. The Royal emblems are Lion facing Rightside and figure of standing lakshmi with elephant on either side pouring water on her. Once these identification and differentiation was done, then it became easy to identify the Rashtrakuta Kings. The King Avidheya of Pandaranganapalli and King Abhimanyu of Undikavatika plates belong to same dynasty. They have same geneology starting with Manaka, Devaraja as son (described as lord of Gods (Indra)), Inscribed in Similar Characters, Emblem of Lion facing Right. One gives the family as Rashtrakuta other is silent. But that is not rare. Now where they ruling different regions. Avidheya was ruling southern Maharastra and Northern Karnataka. Bhavisya was ruling over Northern Maharastra and southern Madya pradesh. The Pandaranganapalli plates gives Mananka as glorious ruler of Kuntala, Conquered Asmaka(godavari Valley) and Vidarbha. The Capital was Manapura, which is today Man(satara Dist), throughwhich Manganga(tributory of Bhima) flows. Another Copper plates from Sisodra in Goa mentions Devaraja father of Chandravarman of gomins. There are many theories on this. This devaraja may be different from Rashtrakutas, Rashtrakutas were originally Gomins etc. This record shows that Devaraja held sway over South Konkan also. So the theory of big Rashtrakuta Empire in 5th century AD is tenable. Mr. Krishnamacharlu who edited Sisodra Plates says the characters resemble Mayidavolu plates of Pallava Sivaskandavarman. He also draws to certain Prakrit expressions found on the grant. Which puts the plates to 3rd or 4th century AD. Now Pandaranganapalli and Undikavatika plates are put at 5th century AD. The grants themselves gives jovian year of Bhadrapada. This does not happen after 5th century AD in South India. So Rashtrakutas started as contemproaries of Trikutakas(ruling over North Konkan, Gujarat and North Maharastra) and Vakatakas (ruling Vidarba). They were lords of Kuntala, because Mananka started as ruler of Kuntala. Dejja Maharaj is also from this family, who gave Gokak Plates grant in Belgaum. This record was issued 845 years of Aguptayika Kings expired. This date corresponds to 532-33 AD. There was inscription from Madhavavarman which was also clubbed to Rashtrakutas. But it now certain, it belong to Vishnukundin Madhavavarman. Kalyani Chalukya records reveal Jayasimha of Badami Chalukyas defeated King Indra son of Krishna. We know Govinda who invaded with his troops of elephants at the time of accession of Pulakesin II belong to Rashtrakutas. Aihole inscription state that Govinda Immdiately obtained reward for the services. But Pulakesin soon annexed all the territories upto Narmada. So the Rashtrakuta empire is replaced by Chalukya Empire. 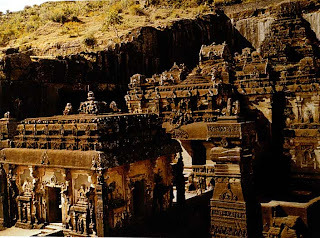 Vindhyashakti II of Vatsagulma Vakataka in Ajanta caves Inscription claims to have defeated Lord of Kuntalas. Mananka is found have conquered Vidarbha. So may be it is a battle with no clear victors. So if we put mananka as Contemproary of Vindyashakthi II, then he flourished around 4th century AD. Prithvisena II father Narendrasena Married Ajjhitabhattarika, daughter of Lord of Kuntala. This princess may be of Rashtrakuta Lineage. Harisena last known Vakataka ruler records victory over Lord of Kuntala. This may also be Rashtrakutas. If we identify Rashtrakutas as lord of Kuntala, then Kadambas of Banavasi as being identified as lords of Kuntala goes. Also we find no record of Kadambas in Kuntala. Certain passages of Kuntaleshwaradautya, a sanskrit work ascribed to Kalidasa, which has been cited by Kavyamimasa of Rajashekara, Chandragupta II Vikramaditya of Guptas sent Kalidasa as an ambassador to the court of Lord of Kuntala. Kalidasa was not well received here, but he gradually gained kuntaleshwara favour and stayed in the court for sometime. When he returned to Vikramaditya Court , he reported kuntaleshwara spending time in enjoyment throwing responsibility and governance on vikramaditya. This Kuntaleshwara is identified as Vakataka Pravarasena II, But this appears plausible as Vakataka did not rule kuntala, they raided few times sure. There is original kuntaleshwars of (Chutus)Satakarnis mentioned in Hathimgumpha inscription of Kharvela. Kharvela has also mentioned to have defeated Rashtrika and Bhojas. Are Rashtrikas the ancestors of Rashtrakutas. We don't know. Rashtrikas and Bhojas are also mentioned in Ashoka edicts. They are roughly ruling the same areas of Maharastra. Rashtrikas can be pronounced Rattas in prakrit. Rattas as later decendents of Rashtrakutas call themselves. But Rashtrakutas do not link themselves to these Rashtrika. Rashtrakutas later moved to Berar where they founded the principality with Acalapura(Elichpur) as their capital. 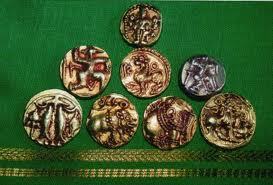 the Tivarkhed Plates of Nannaraja shows family ruling in 631 AD. This gives geneology of Durgaraja, his son Govindaraja, his son Svamikaraja and his son Nannaraja. Altekar gives Approximate dates to them starting with 570AD with twenty years each. When Pulakesin II defeated Kalachuri Bhuddharaja and annexed all territories including, Maharastra, Vidarba, Konkan, Central and Southern Gujarat. He placed his trusted chiefs in thier positions. Sendraka in Gujarat. Similarly he should have placed Svamikaraja in Berar. We can find Nannarja plates resemble Kalachuri records, who preceded them. One thing that has to be noted here is that Early Rashtrakutas were saivites and later Rashtrakutas are Vaishnavites like Chalukyas. The Eagle has replaced Lion as emblem. 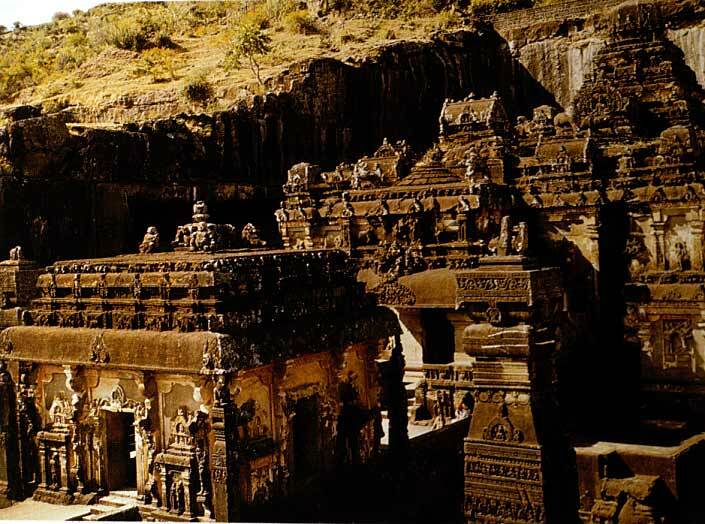 From the Inscriptions we find Mananka founded the rule at Manapura, Which is todays Man in Satara District. The River Manganga, tributory of Bhima flows through this place. They call themselves as Lattalura-puraveshvara , which means lord of the great city of Lattalura (Latur). Latur is not far away from Satara. They might have originated. Other Claims of origin we have already dealt in the Origin of Rashtrakutas article.